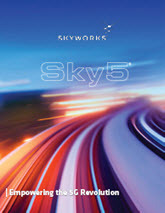 In our corporate brochure, we invite you to learn more about Skyworks and how we are enabling the world’s most innovative devices – facilitating secure, high-speed and “always on” connectivity. 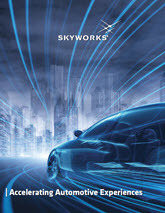 Skyworks’ brochure answers your questions about who we are, what we offer and why you should partner with Skyworks. This brochure is also available in Simplified Chinese, Traditional Chinese, Korean, Japanese and Spanish. 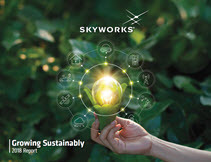 Skyworks' Sustainability Report highlights our commitment to transparency and continuous improvement. 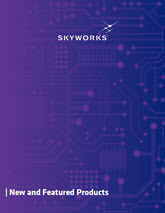 The report is intended to provide stakeholders with important information regarding the status of Skyworks' programs and performance in Environment, Health and Safety, Ethics, Labor, and Management Systems and provides performance metrics highlighting our use of natural resources, waste generation, injury and illness rates, and much more. 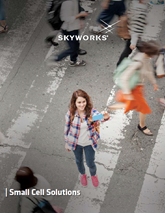 Skyworks’ University Relations Program seeks students who are currently enrolled in (or have recently graduated from) an associate’s, bachelor’s, master’s or Ph.D. program. We hire interns, co-op students and recent graduates globally for all of our business units. We develop and maintain relationships with colleges and universities across the U.S. and around the world. 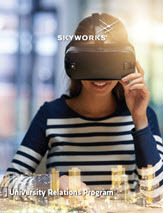 Skyworks participates in on-campus recruitment events such as career fairs, information sessions and technical seminars, and partners with a variety of student organizations. Please visit our Careers page to learn if we will be visiting your campus soon! 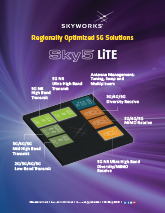 Sky5™ is Skyworks' unifying platform that will power revolutionary 5G applications. 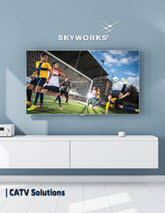 Our unprecedented Sky5™ suite of highly flexible and customizable system solutions provide breakthrough performance, footprint and power efficiency transforming the way we live, work, play and educate. This brochure is also available in Simplified Chinese. 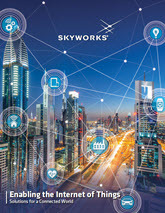 Skyworks invites you to browse our innovative Internet of Things (IoT) featured products for a broad array of markets and applications – from automotive to the connected home, industrial, machine-to-machine, medical, mobile devices and wearables – Skyworks has connectivity solutions to help you develop and launch your great new ideas. 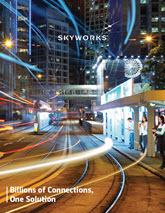 Wherever you are, Skyworks' infrastructure solutions are enabling faster data connectivity. Whether in a few cell phone towers thinly disguised as trees or in small cells hidden under stadium seats and lamp posts, our groundbreaking products are connecting people with the information they need. Our broad portfolio spans RF components to complete subsystems—from the antenna connection to the baseband output—for applications ranging from small cells to repeaters to macro and massive MIMO base stations. Partner with us on your next project to enable multimedia and data intensive platforms that are exploding across mobile, the Internet of Things and emerging 5G devices. We are at the forefront of developing revolutionary wireless solutions. Groundbreaking, in-vehicle technologies and rapidly changing standards are being adopted at a pace previously unheard of in the automotive industry. With Skyworks as your partner, there is no need to worry. Our innovative portfolio takes seamless connectivity in today’s cars to the next level – making the driving experience increasingly smarter and safer. By leveraging our leadership and expertise in wireless to deliver cutting edge communication technologies such as 5G NR for cellular, vehicle-to-vehicle (V2V) communication and 802.11ax Wi-Fi to new vehicles, we can help you elevate the driver experience. Intelligent antenna management plays a critical role in today's high-performance smartphones, particularly with the onset of 5G and the addition of new features and performance requirements. In fact, the number of embedded antennas in mobile devices is increasing, while board space is being reduced to accommodate the adoption of full screen infinity displays. 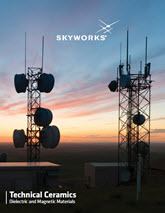 Skyworks' portfolio addresses this need to integrate more RF functionality, features and antennas into smaller and smaller form factors by offering innovative tuners, swaps, and RF couplers that enable RF system engineers to optimize antenna power and efficiency. 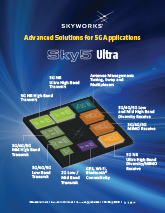 Skyworks’ wide-ranging solutions are addressing a number of growing markets including CATV where we are enabling the delivery of high speed data channels and content to subscribers around the world. With the pace of technology developments continually changing the way consumers receive information and entertainment, we are supporting the ever increasing demand for data requirements, combining world-class performance with industry-leading reliability. We have the most comprehensive portfolio of wide bandwidth DOCSIS 3.1 and EuroDOCSIS 3.1 compliant ultra-linear RF amplifiers. 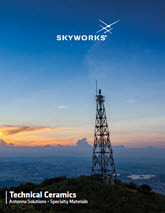 As an innovator of high performance analog semiconductors connecting people, places and things, Skyworks' small cell solutions are enabling advances in wireless infrastructure. With the rapid growth of multimedia and data intensive platforms creating capacity challenges for wireless providers and telecommunications manufacturers, our devices meet the demand for scalable, high-capacity infrastructure solutions for next generation networks. We offer a broad portfolio of products that support data capacity increases of wireless networks in the home, at the office and across commercial, retail and outdoor public spaces. 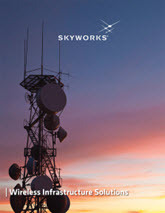 Skyworks’ portfolio of RF/microwave products support a broad array of applications including avionics systems, electronic defense and countermeasure platforms, global positioning devices and land mobile radios. 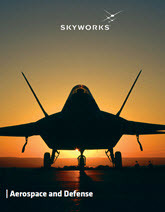 In addition to Skyworks’ standard consumer off-the-shelf (COTS) product offering, we offer a broad portfolio of technical ceramics and advanced materials through Trans-Tech, and high-reliability ceramic hermetic packaged devices through Isolink, wholly-owned subsidiaries of Skyworks Solutions. Skyworks Solutions, through its wholly-owned subsidiary Trans-Tech, is the industry leader in technical ceramics. With over 60 years of experience, we offer a complete line of high quality, low-cost ceramic-based materials for a number of RF and microwave markets including wireless communications, infrastructure, military, cable television and broadband access. Our in-house manufacturing capability enables us to deliver materials ranging from custom particle size distributions for thermal barrier coatings and fuel cells, to machined precision components. Skyworks Solutions, through its wholly-owned subsidiary Trans-Tech, is the industry leader in technical ceramics materials with over 60 years of experience and in-house manufacturing capability. Our product portfolio includes dielectric resonators and coaxial transmission line elements for dielectric resonator oscillator (DRO) and voltage-controlled oscillator (VCO) applications, ceramic bandpass filters, ferrite and garnet material for circulators/isolators, and advanced materials in technical powders or ingot form. 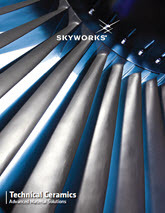 Skyworks Solutions, through its wholly-owned subsidiary Trans-Tech, is the industry leader in technical ceramics. With over 60 years of experience, we offer a wide variety of materials available for antenna applications. These include our entire suite of dielectric materials (D-125, D-73XX, D-9000 and the MCT series), as well as hexagonal ferrites for high frequency magneto-dielectric antennas. We can also deliver an enhanced Co2Z material when higher Q values for the 300–700 MHz range are required.